are some of the most inspirational stories and informative speeches on the net. Use these excellent public speaking videos to inspire you to overcome your fear of public speaking. 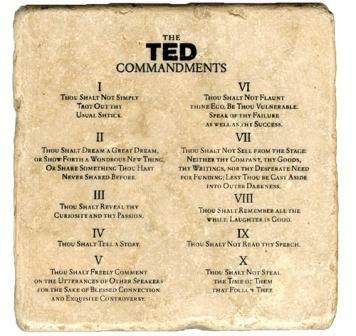 I thought you might enjoy the TED Commandments which set the scene for what you'll find on the site. I like all sorts of speakers so don't expect any patterns in my choices. What I do value are presentations that inspire me, or which have new information or a new perspective on an old issue and above all talks that make me laugh (or at least smile a bit). I really hope you enjoy these and that you love public speaking at least a bit more after watching them. Or just go to the TED Home Page & rummage around for yourself.